When it comes to temperature control we are able to offer a complete control solution. 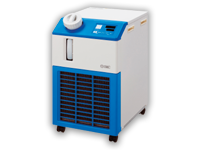 From bench top solutions to full-scale plant operations, we offer a range of chillers to cover from 200W to 60kW, suitable for a wide-range of biopharmaceutical process applications. Our Peltier Type Bench Top thermostatic baths offer temperature stability with no moving parts, reduced noise levels and Water cooled and air options. This method has a fast response and can shift quickly between heating and cooling, so temperature can be controlled very precisely with stability to +/- 0.01°C. We also offer process sized chillers up to 4.8KW as well as the HED series which is suitable for chemical applications. Why not contact us to discuss your temperature control requirements further. SMC Thermo Chiller – HRS Thermo Chillers are designed to meet the widest range of single-point applications in both industrial and technology settings. Robust enough for the factory, yet ergonomic and compact for lab installations. 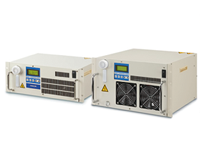 Rack Mount Chiller – Refrigerant-free temperature control device mountable in a 19-inch rack. Rack mounting is the perfect solution in a process where space is limited, with the option to add rubber feet for desktop applications.